Subscribed 2018 is Zuora’s flagship customer event. It’s a conference designed to help you master the changing world of recurring revenue and do your job better with Zuora. We’re taking 2017’s User Summit to the next level with a full 2-day user experience packed with role-based networking, hands-on training, & dedicated time with Zuora product experts. We are also combining the former Revenue Recognition Summit with Subscribed to expand the education, experience, and networking opportunities for the RevPro community. Not yet a customer? Subscribed 2018 remains THE destination for Subscription Economy disruptors, innovators, and business leaders to inspire success, share best practices, and learn. Subscribed 2018 is all about our customers! We’ve transformed 2017’s standalone User Summit into a 2-day user conference that runs throughout the entire show, complete with role-based training, 1:1 product support, and tons of networking. That means from start to finish, Subscribed is dedicated to making you successful and your day job easier. Expect deep-dive product conversations & hands-on training across sessions built for Operations, Billing & AR, Revenue, Accounting, FP&A, and IT. Not yet a Zuora customer? Or are you a customer seeking thought leadership content in addition to product training and support? We’ve got you covered! 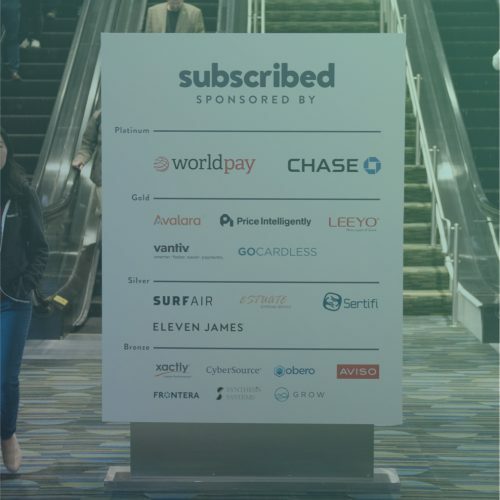 Subscribed 2018 remains the destination for all-things Subscription Economy. With thousands of innovators, disruptors, and business leaders in attendance from SaaS startups to Fortune 500 companies, you’ll enjoy thought-provoking keynotes, educational breakouts, & new industry connections that will prepare you to lead the growth of your subscription business. Are you at the helm of an organization navigating the changing world of recurring revenue? You don’t want to miss Zuora’s inaugural Subscribed Institute— an invite-only, strategy forum for executives looking for actionable insight on how to grow & transform their organizations. Attendees will leave with new connections & next steps for step-change improvements in subscription business growth, customer experience, and organizational strategy. Is there a technical or business customization you’re looking to solve? Are you a business user looking for technical resources to help you overcome a process challenge? If you answered yes… then the Subscribed Hackathon is for you! Participants will delve into developing apps on Zuora’s application marketplace, Zuora Connect, and get free food, drinks, and unfettered access to Zuora engineers. Build something meaningful for your company and others in the Subscription Economy and win awesome prizes while doing so. Click here for more information, including how to register. *Indicates User Training and/or CPE Sessions which requires a Full Access pass. Grab your breakfast and conference pass and say hello to our Subscribed 2018 sponsors in the expo! If you're a member of our Subscribed Institute, CFO Exchange, CIO Exchange, Subscribed speaker, analyst, or press community, you can expedite the registration process by joining the VIP line. The Learners’ Lounge is back with more options to discuss your use cases with other users and Zuora teams, learn how others use our products and network with your peers and Zuora experts: Learning Bar, Table Talks, Flash Talks and Mentoring Sessions (sign-up required). For more information and sign up for mentoring click here. Experience the newest innovations of the Subscription Economy in our interactive Subscribed Showcase and partner ecosystem expo. If you're a member of our Subscribed Institute, CFO Exchange, CIO Exchange, Subscribed speaker, analyst, or press community, grab your front row seat in our VIP seating area. Zuora's inaugural executive innovation forum that will enable leaders to progress their subscription business strategies and offer recommendations for step-change improvements in subscription growth, customer experience, and organizational change. Registration is now closed. You've heard the news that the Community is where it's at, but what exactly is it? Grab your lunch and learn how you can impact our product roadmap, connect with your peers and Zuora experts, participate in early adopter programs and more... all through the Zuora Community. This session is great for those who are unfamiliar with the Community; for veteran members, check out the session "Zuora Community: Best Tips and Tricks" on Day 2. Whether you're new to revenue automation or a seasoned RevPro user, join us for this keynote address where you'll hear about current challenges for revenue leaders, what's on the horizon for solving the biggest pains in accounting and revenue recognition, and how technology has evolved help to modernize your revenue operations. Pricing and packaging can be an effective lever for fast-growing subscription organizations. However, many organizations struggle with how to implement and manage pricing and packaging strategies, leaving money on the table and disenfranchising or confusing customers in the process. Session attendees will see case studies of the most effective pricing and packaging approaches, and proven strategies for ongoing management, including testing, administration, gathering feedback/measuring success, and iterating. Interested in learning about how customers have implemented Zuora? In this session, we'll share how we approach every implementation and Hudl will share their success story and lessons learned. As the Subscription Economy continues to grow, a new framework is needed to measure and analyze business health, and provide insight into the entire customer subscription journey. This new framework is powered by subscription metrics: forward-looking metrics -- from ARR to churn -- that predict business performance. Come to this session to learn how Zuora has operationalized these metrics using the PADRE framework. The payments industry is in a state of flux, driven by the continued digitalization of payments and shifting demands of today's global consumers. Join members of our payments partner ecosystem, AmazonPay and Merchant eSolutions, to gain insight into current payment trends so you can meet the ever-changing expectations of demanding subscribers. Do you use Salesforce? Good news, Zuora has a native integration to Salesforce for your Sales team called Zuora CPQ. In this session, you'll learn about the value of CPQ to enable your users to quote and create subscriptions from Salesforce. We'll also talk about setting up connections, synchronizing records and other essentials to help your Sales team configure deals, not just products. Learn how to set up and manage your product catalog so that it leads to a better downstream billing experience. The product catalog decisions covered in this session include when to use out-of-the-box charge models vs. open charge models, when to create rate plans vs products, and when to use the different discount options available. You'll leave this session with the know-how to better maintain your product catalog to improve billing operations...and your customers' experience. *User Session; for customers and requires Full Access pass. Zuora's inaugural transformation forum for executives that will enable leaders to progress their subscription business strategies and offer recommendations for improvements in subscription growth, customer experience, and organizational change. Registration is now closed. It's no secret that SaaS companies need to grow fast to survive. Over the years, we've seen 10 growth strategies executed again and again throughout all of the fastest growing SaaS companies in the world. Join this session to learn how leading SaaS companies put the right programs and technology in place to achieve that hypergrowth. By 2020, five billion people will be online, with 25 billion devices and machines using the Internet. Many devices will share data and services, and the way we engage with them will fundamentally change. In a connected world, consumer expectations of executing transactions will be greater than ever. Don’t wait until 2020 to address consumer pain points and overcome technological barriers. Come to this session where Kevin Gordon, Lead Innovation Architect at Worldpay, will share new ways to connect with customers in the IoT space. You're certain to leave with actionable insights based on Worldpay's research and best practices. Gain insights on the "State of the ASC 606 Union." This session will highlight what's happening in the market, the impact of the guidance for various industries, and key trends accounting experts foresee over the next 12 months. (CPE) Full Access pass required for CPE credits. In this session, Zuora product experts show you how to generate reports in Zuora to understand the drivers of -- and take action on --bookings, billings, cash, and revenue. You'll leave with a greater understanding of Zuora's object model as well as tips and tricks for running non-standard reports. *User Session; for customers and requires Full Access pass. Are you a RevPro user? Have you been hungry for some hands-on training? This year, the Zuora University Team launched a brand new curriculum to help customers and partners quickly get up to speed with RevPro. Come to this session to get a flavor of what's available and upcoming. Finding it impossible to calculate subscription data to accurately recognize revenue? At this session, our product directors explain how the productized integration between Zuora Central and Zuora RevPro solves this very problem. You'll leave understanding not only how the Subscription Orders Engine feeds RevPro out of the box (no intervention required! ), but also what's on the roadmap for the coming year. Interested in building on Connect, Zuora's developer ecosystem? Learn from experts who've successfully done it and hear from one of Zuora's partners who has extended Zuora's functionality to meet their unique business needs through Connect. Bogged down with manual processes and sub-optimal workarounds? Take your billing and payment operations to the next level with Zuora’s Advanced AR settlement. This session covers a complete overview of Zuora’s new accounts receivable settlement features and selected demonstrations of Zuora credit and debit memos, unapplied payments, and item-level settlement, and the efficiencies they can bring to your subscription business. Companies need more agility when launching new products to drive growth in hyper-competitive markets. At this session, we'll share significant accounting judgments and operational considerations when expanding your revenue through bundling (or unbundling) offerings, acquiring a company, or converting to full or hybrid usage-based revenue models. (CPE) Full Access pass required for CPE credits. Usage models can help align cost with customer experience, and are an important component of the pricing toolbox of any digital product or service. However, while usage-based pricing models can be rewarding for a company's growth, overcomplicating your usage model is a dangerous and slippery slope. This session will cover considerations for usage metrics, the types of customer usage and behavior that need to be tracked and analyzed, program elements such as tiering and thresholds, and critical components for success. If you're responsisble for platform integration, this session is for you. You'll learn about Zuora's object model, data sources, notifications and REST APIs. You'll leave ready to integrate and build! Usage-based pricing is an effective growth tool. But if you can't manage it, how can you monetize it? Come learn about usage from end to end: the systems it's pulled from, how to format and upload it into Zuora's UI or via API, setting up usage notifications, and more. We know upgrades can be painful, but upgrading to CPQ 9.x will give business users access to a host of great new features. Learn how to prepare for this upgrade and hear tips from customers who've successfully gone through the process. Optimize revenue collections while simultaneously reducing the stress of your payment operations team. In this session, we'll show you how to configure, implement, and run automated payment and reports through Zuora. *User Session; for customers and requires Full Access pass. As a subscription business, you run on a new set of customer-centric metrics like LTV, MRR, Net Retention, and Churn Rate. But actually calculating these metrics is complicated and time-consuming. In this session, our product experts show you how Zuora Insights effortlessly computes board-level metrics you can trust. Zuora RevPro's new UI offers many enhancements, including a brand new navigation paradigm that better uses screen real estate and reduces the number clicks to reach key screens; "Excel-like” freeze and filter capabilities added to all grids; the ability to configure your own dashboards and save an unlimited number of filters. Come learn how to accelerate your revenue operations with these features and many more! Pricing is the highest impact growth lever on your business, beating out acquisition or retention based growth by 2-4x. Yet, we spend less than 15 hours per year optimizing our pricing. This lack of focus just doesn't work in the subscription economy. Leveraging data gleaned from his experience with over 8k recurring revenue businesses at ProfitWell (formerly Price Intelligently), CEO Patrick Campbell will share data-driven insights on the critical components of strategic D2C subscription pricing plans to help you harness value-based pricing as a central growth lever in your business. Want to find out more about the magic of RevPro? Come to this session and get a peek under the hood at our key product capabilities and how they can help you drive faster, more accurate revenue reporting with automation. All businesses want to optimize payment capture capabiliites to prevent revenue loss. In this session, we'll hear best practices for managing even the most sophisticated payment operations from thought leaders Chase, Stansberry Research, Zoom and The Motor Trend Group. In the world of software implementation, a well-designed process leads to a technical build that's functional, intuitive for the end user, and aligned to business process. Come to this session to learn how Appspace has customized Zuora CPQ and Salesforce for their business. You're certain to take away tips to apply to your own implementations. *User Session; for customers and requires Full Access pass. Billing Managers at all enterprise software companies know that month-end billing of Professional Services hours is a pain! But it doesn't have to be.... Come to this session to hear from the cross-functional leads at Zuora who decided to load this data as usage. They'll share the details of the solution they put in place using Zuora and the impact it's had on their workload and the business. You'll leave eager do the this at your company too! Yes, we drink our own champagne! Find out how Zuora uses our own reporting tools to run our Subscription business. Developing an enterprise platform is more complex in a monolithic architecture - make one change, and the whole platform is impacted. In order to establish ourselves as an enterprise-grade platform with consumer scale, Zuora is making the shift to a microservices architecture. In this session, our Engineering leadership outlines our approach to this significant initiative, best practices for microservices adoption, and the results we've seen so far from this transformation. Automobile purchases dropped in 2017. Fewer teens are getting their driver’s licenses. Uber provided 4 billion rides worldwide last year. Alternatives to ownership are taking off. Why? Because the transportation services market is a $5.4 trillion opportunity and people simply don’t want to deal with the hassles of car ownership when technology is enabling new alternative models. In a panel moderated by Wall Street Journal reporter Tim Higgins, chief executives from Silvercar, Turo and Fair discuss how the subscription business model is quickly becoming the future of the auto industry. Each company has a different approach to solving the limitations of ownership, but they all have one thing in common---they all start with the customer and not the product. Featured Keynote – Flipping the Script on Hollywood, Twice? Mitch Lowe has played a significant role in changing the movie and television business forever. First as a co-founder of Netflix, the company that upended broadcast television and took down blockbuster. Next, as part of the executive team at McDonalds, he later launched Redbox, the hugely popular movie kiosk chain. His new mission at MoviePass is to bring people back to into the movie theatres and with 3 million subscribers and growing, that mission is well underway. Today, 1 in 30 movie tickets are purchased by MoviePass but some theatre chains don’t like it. They say it’s hurting their business and claim that MoviePass will be out of business soon. Who will be right? Join us for what’s sure to be a fascinating discussion about what happens when you’re courageous enough to put customers at the center of your business model. This closed-door dinner and networking event will bring together & foster connections between leading CIOs who are challenging the status quo and differentiating their businesses with disruptive technologies. Request your invite here. Get to know the Subscribed 2018 sponsor community and your fellow attendees over fun cocktails, food stations, live music, and a few surprises! Details: Marriott Marquis / Salon 9. This closed-door dinner and networking event held exclusively for financial executives will foster peer-to-peer networking & provide guidance on how to manage the complexities of a subscription business model while driving efficient growth. By invitation-only: consult your Zuora solution expert if you're interested in attending. A closed-door executive reception where you can mingle with Zuora leadership & product experts, ecosystem partners and fellow Subscription Economy leaders. By invite-only: consult your Zuora solution expert if you're interested in attending. Subscribed After Party @ Local Edition! Subscribed 2018 is Zuora’s 2-day user conference & the destination of the year for customer training, networking & 1:1 time with Zuora product experts. Subscribed also remains the only global conference dedicated to recurring revenue-based business models and revenue management automation, bringing together the disruptors, innovators, and leaders of the Subscription Economy. Zuora users and business leaders across the Subscription Economy ecosystem. Past conferences have hosted 2000+ attendees from CFOs to Zuora admins, CIOs to growth hackers, product marketers to sales leaders, founders, CEOs, and more. As the Subscription Economy cuts across all industries and all businesses, we welcome guests from startups to Fortune 500 companies representing software, hardware, IoT, retail, auto OEM, media, data services, and more. View our 2018 Subscribed prospectus for packages available for this year’s Global Subscribed series. Should RevPro customers and prospects attend Subscribed 2018? Yes! The Revenue Recognition Summit has been combined with Subscribed. RevPro customers and prospects will gain valuable insights from industry experts, partners, peers and Zuora RevPro product experts. A dedicated breakout track and CPE credits will be available.